St. Angela Merici School is honored to recognize the accomplishments of Timothy King, entering 7th grade this fall. He received an Honor Recruit Award from Sheriff Newell Normand on July 28, 2016. 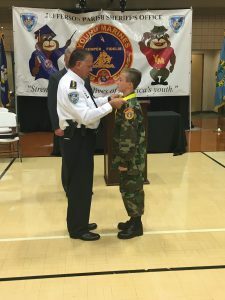 Timothy received the highest award for finishing at the top of the Recruit Class for the JPSO Young Marine program that took place over six weeks this summer. The Honor Recruit Award is awarded to the young marine recruit who is designated the outstanding member of the Recruit Training Class and whom has displayed exceptional leadership qualities. The Young Marines Program is a National Youth Program open to qualified candidates of both boys and girls between the ages of 8 and 17. It is the sole youth program, which boasts to be the official anti-drug program of the United States Marine Corps. Congratulations to Timothy and his family. We are proud to have you as part of our St. Angela Merici family.